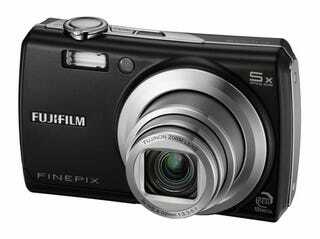 The Fujifilm FinePix F100fd, which follows up the F40fd and F50fd with 12-megapixels, 360 degree facial detection, 2.7-inch LCD, dual image stabilization, red eye removal, dual-shot mode, and IR image transfer. It's a lot of spec for the money. Available in March for $379. But with a lens and sensor likely smaller than the S100FS above, I'm doubting its better quality. Also, the 360 degree facial detection detects faces no matter where they're looking, which is nice, but not that useful unless you really enjoy taking pictures of people who don't want to be photographed. Valhalla, N.Y., January 24, 2008 - Following the long line of award-winning F-Series models, FUJIFILM U.S.A., Inc., today announced its latest and greatest, the FinePix F100fd digital camera. "The FinePix F100fd demonstrates how consumers can ultimately benefit from Fujifilm's investment in professional photography," said David Troy, senior product manager, Consumer Digital Cameras, Electronic Imaging Division, FUJIFILM U.S.A., Inc. "The features packed in to this camera like ISO ranges and wide dynamic ranges are unprecedented for a compact consumer model - they first appeared in our Professional line. Combine these advances with our new Face Detection 3.0's faster, 360 degree detection ranges and Dual Image Stabilization and you have the ultimate consumer digital photography experience." Dual Image Stabilization: Combine mechanical image stabilization with the effects produced with higher ISO. Dual Shot Mode: In this selectable mode, the FinePix F100fd quickly shoots two images in rapid succession - one with the flash and one without - and saves both. This convenient function lets users perform a comparison at their convenience and select the most pleasing image. xD / SD / SD-HC Compatible slot: The FinePix F100fd features a "xD/SD Compatible slot" which accepts not only Fujifilm's traditional xD-Picture Cards but also Secure Digital (SD) and SD-High Capacity/SD-HC cards too.